Aimee Ray recently created this free pattern, 'I play with dolls' to celebrate Girl's Day in Japan*, which was on 3 March. You can find out more about Girl's Day and download the pattern, on Aimee's blog, here. 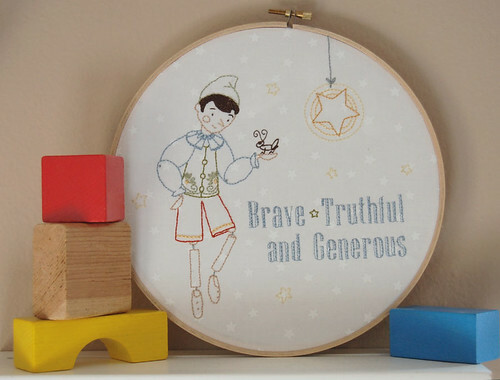 And not to exclude the boys (although of course there's nothing wrong with boys playing with dolls ;) ), I thought I'd also mention this other great free pattern I've noticed recently, this one from September House. Corinne from September House made this free pattern for Celebrate the Boy 2011, a great series of blog posts over on Made and Made by Rae, you can find this lovely Pinocchio pattern over on the September House blog, here. *My thoughts are still very much with the people of Japan right now. Lovely finds! Especially smitten with the 'Real Live Boy Pattern'! Ooooh thank you for directing us to these absolutely adorable patterns! I snapped up 'I Play With Dolls' as soon as Aimee posted it on her blog; I adore everything she does! And I am IN LOVE with 'Real Live Boy'! That is what I call my Maltese Dawson, because he so often reminds me of one. I will be stitching that up on something for him soon!